Do you need a new vision for the new school year? 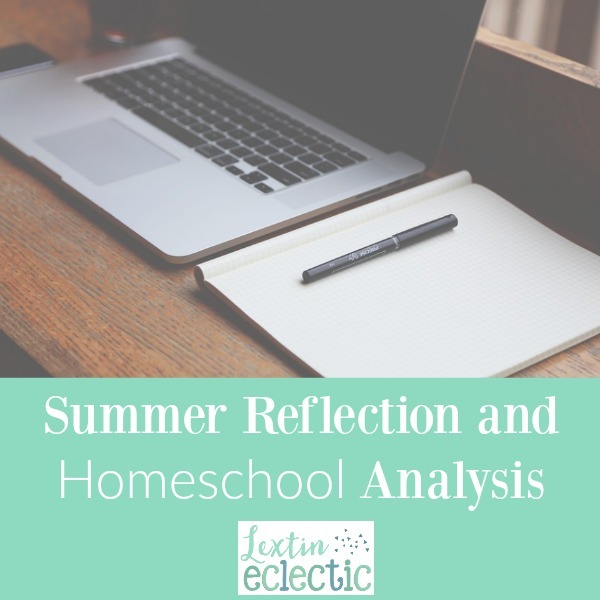 Whether you homeschool through the summer or not, it’s the perfect season to take some time to reflect on your homeschool. Through this time of reflection you can establish a new vision and create some goals for a new year. If you’re wanting to reevaluate and refocus, I invite you to join me on this 4-part series to create a homeschool business plan. You can download the workbook below and get started. Check back each Monday for the new post! This summer I tried doing something called a S.W.O.T Analysis. It was my husband’s idea. As he explained how he had performed an analysis at work, I realized that this method would work well in a homeschool setting. It stands for strengths, weaknesses, opportunities, and threats. To complete the analysis, first you reflect on your strengths. Strengths can be defined as things that you have expertise in or things that your children do especially well. They can also be positive character traits or other qualities. Ask yourself what went well this past school year. What were your strengths? Next, think about the weaknesses that kept you from accomplishing your homeschool goals. Reflect on why these goals were not met. Where did you or your children fall short? Opportunities are a chance to evaluate ways that you can improve in your homeschool. When you think about your opportunities, think about all the resources available to you and analyze whether you are using them to their fullest potential. Finally, think about what threats your homeschool faces. Write down all the situations that might upset your future homeschool plans. List anything that might derail your homeschool year. So, as you think about your strengths and weaknesses, take time to reflect on the past year and write down everything that went well and everything that did not work as well. When you get to the next section of the analysis, you’re going to be looking forward and planning for the future. You’ll develop a plan to help you be more successful by thinking about opportunities for your homeschool and the threats that can undermine your success. I’m going to share how I walked through a homeschool S.W.O.T analysis. Did you grab your homeschool business plan workbook to get your own S.W.O.T analysis worksheet? If not, make sure you’ve downloaded it so you can get started. I now have several years of homeschool experience and I’m beginning to feel more confident in my abilities. I have found a system (color-coding and using binders) that has helped me stay more organized. My homeschool schedule worked well – I started early in the morning with my 3 oldest children and then added in the youngest girls after breakfast. I rotate through all of my kids in the morning and then have group time after lunch. I used several programs that I have been using for multiple years. Therefore, I have a lot of knowledge about those programs and those publishers so I am comfortable using their resources. My older kids are now solid readers and are able to help me with their younger siblings. They help explain math problems if I am busy and they take turns reading to each other. My oldest child has become very independent. I tried using some DVD based curriculum and she thrived as she watched lessons and then worked on her own while I taught younger children. My next two oldest children began working independently in just a few areas but it saved me a lot of time during our homeschool day. We experienced a lot of reading success – two children are now fairly fluent readers while a third child is making significant progress. Piano lessons and sports activities were consistent were a wonderful addition to our week. My kids learned several new chores and helped keep the household running by doing laundry and dishes. I had a toddler who began crawling and then walking this past school year. She learned how to get in to absolutely everything in my house. It was challenging to keep an eye on her while teaching my other children. Now that I have 4 children doing formal schoolwork (plus a preschooler) I’m finding that my table is not quite big enough – it only has space for 4 children. I’m also running out of space on my bookshelves. My oldest began a more indepth study of Latin and Spanish and is finishing up basic arithmetic. This means that I’m feeling less confident teaching some of these more challenging topics. I had to work ahead more often and try to look over some of her work ahead of time. This past school year I added an additional student – my Kindergartner. This means that I was teaching 4 grade levels, 5th, 3rd, 2nd, and K. I found it extremely hard to add an additional student into my schedule and spend adequate time with all of my kids. Because our homeschool day was taking longer than in previous years (since I had more students doing formal school work), I found that I had less time for myself. I also had less time to devote to housework or to cooking. My son (3rd grade) went through several growth spurts and a phase of really poor attitudes about schooling. It was challenging to remain encouraging during our school time together. I had over-planned our year and had expectations that were too high. A few months into our year I had to simplify things to make our days flow more smoothly. My Kindergarten student struggled hugely in math. After getting halfway through our curriculum, we actually had to start over at the beginning. By the end of the year she was not even halfway through the math book. We did not experience as much success in spelling as I had hoped. We will need to review the spelling concepts again before starting our new year. We didn’t cover much art during our school year. Our schedule was very full and art often got pushed to the side. I had the chance to attend two homeschool conventions where I received lots of encouragement and some great tips for our new homeschool year. Because we are not doing much school over the summer, I have time for self-education for me. I have quite a few books and resources that I want to review to help me plan for a new year. Now that we have lived in our state for several years, I finally feel more connected within the homeschool community and have built a support network. I’ve had the chance to get together with other local moms as we encourage each other and learn from one another. For our year, I’ve chosen a history and science curriculum that will be easier to use with all of my children together so we can combine those subjects. I’ve also chosen several independent options for my oldest, as well as an online class, to help streamline my teaching time. For the upcoming year, my older 3 children are going to do a lot of the read alouds for the younger 3 children. Now that the older 3 are fluent readers, I am going to have them take turns reading aloud, allowing me to get more things done around the house. Over the years, I’ve discovered that I teach best when curriculum is fairly planned out for me and is more open-an-go with scripting or extensive teacher notes. I’ve chosen curriculum for the new school year that fits within these parameters so I feel like we will be successful with those choices. Next school year I will be adding a few preschool activities with child number 5. That means that I will have to fit more in to my school day. I worry that I will feel overwhelmed and short on time. My 4 oldest children are now on a year-round swim team and that is a huge commitment. They also all play piano and in the warmer months they each play golf. This means that our evenings are fairly busy. It will be hard to complete our schooling and get housework done with dinner on the table before our evening activities. With the new preschooler added to our schedule, I worry that my children will have less time for free play and their own pursuits. I fear that I will struggle to fit all the subjects into our day while still allowing them some play time. Now that my oldest will be in middle school, I’ve noticed that curriculum can be more expensive. Also, I am planning on a few online classes to help lighten my teaching load. This is an additional expense. Because my day is going to be very full and my evenings will be busy with extracurricular activities, I worry that I may experience burnout this upcoming school year. I’ve become more active on social media through blogging and I fear that I might begin comparing myself to other homeschoolers. This can make me feel guilty or inadequate in my homeschool. So, there’s my homeschool S.W.O.T. analysis. It’s really helped me think through all the things that worked well in our homeschool while being mindful of the things that did not go well. I feel more prepared to begin our new school year while being aware of the challenges that I could potentially face. Don’t forget to take some time to reflect and plan for your new school year over the summer. And you can download my free homeschool business plan workbook to complete your own S.W.O.T. analysis as well as see guiding questions to help you think through each section. And if you’d like one organized place to keep your homeschool records, be sure to check out the Homeschool Record Keeping Notebook! Come back next Monday and read about the second part of your homeschool business plan! Thanks for sharing this. As a teacher I’m always curious about how homeschoolers set goals. Great post and very insightful!